This Fantastic Food 1.0 responsible themes is in orange color and most suitable for those seller who want to increase their sales on the title of food , restaurant, wine and drinks In front page we have focused image slide show with featured product. This themes is compatible in 5 different language – English, German, Spanish, French, Italian . All the language was translated through Google online language translation tool. Devil Sider is best option to hang your online user for a minute . So that you can give message with fancy slide show. You can configure image slide show from back office. It is compatible in multiple device in PC, Notebook and tablet such as iPad and Android Tablet and mobile devices. 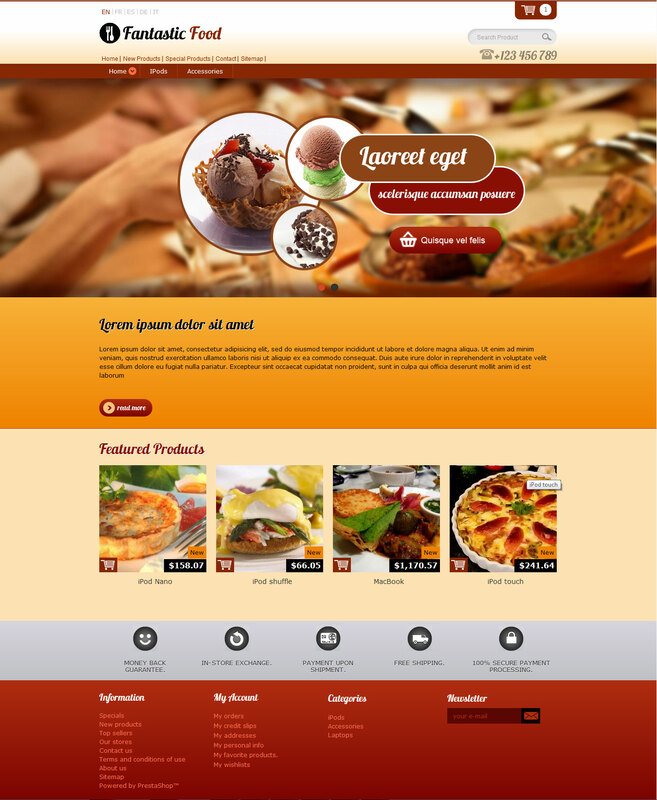 This entry was posted in Brown, Food and Drinks, orange, Responsive Prestashop Themes, Show all Themes, Uncategorized, yellow and tagged 1.5.4.0, Food and Drinks Prestashop Themes, Responsive Prestashop Themes, Responsive Restaurant Prestashop Themes on April 30, 2013 by devilthemes.